Selahattin Demirtaş, co-chair of pro-Kurdish Peoples’ Democratic Party (HDP), was taken to Edirne Prison in northwestern Turkey after a Diyarbakır court ruled for his arrest on Friday. 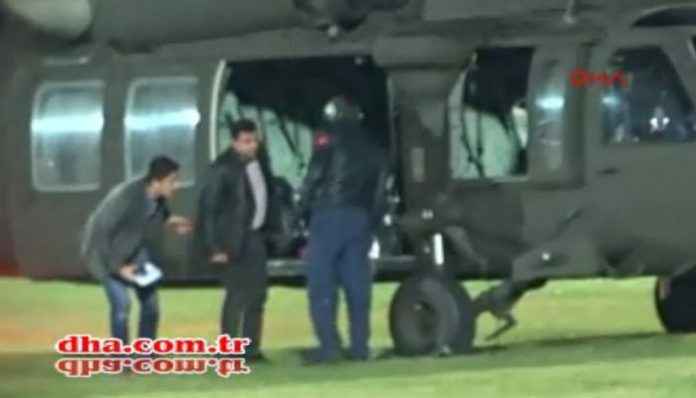 Demirtaş was seen landing in a police helicopter on a sports field near Edirne Prison escorted by counterterrorism police. Turkish courts on Friday arrested nine HDP deputies including the party’s co-chairs, who were detained in the early hours of Friday following police raids on their homes. HDP Co-chairs Demirtaş and Figen Yüksekdağ and deputies İdris Baluken, Leyla Birlik, Nursel Aydoğan, Selma Irmak, Ferhat Encü and Gülser Yıldırım were arrested on Friday afternoon. Counterterrorism police in the early hours of Friday raided HDP headquarters in Ankara and conducted a search of the premises while 12 deputies, including the co-chairs, were detained in police operations in Ankara and the southeastern provinces. The operation was launched after the HDP deputies refused to testify about alleged crimes linked to “terrorist propaganda. Three deputies, Ziya Pir, İmam Taşçıer and Sırrı Süreyya Önder, were released on probation early on Friday. Abdullah Zeydan was also referred to court and arrested on Friday night. HDP Şırnak deputy Faysal Sarıyıldız and Van deputy Tuğba Hezer Öztürk, who also face detention, have been reported to be out of the country.